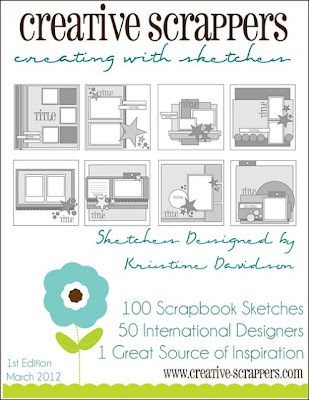 I’d like to share some “love” by posting a Giveaway today….a wonderful book of sketches just released by the super talented Kristine Davidson of CREATIVE SCRAPPERS. 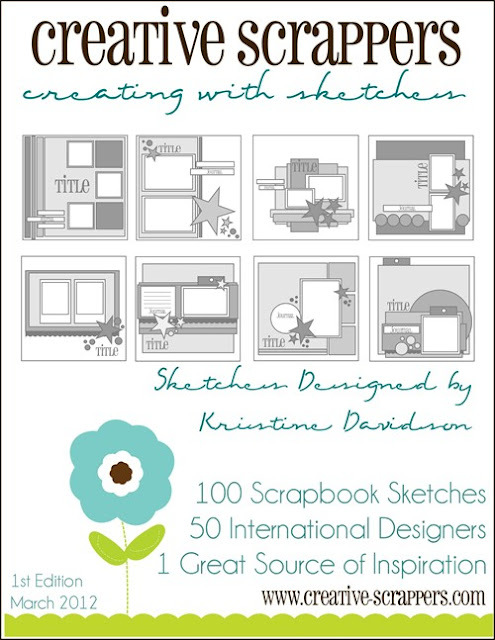 Kristine is well-known in the industry for designing fantastic sketches for scrapbookers, and I am so excited to tell you that one of my layouts appears in her new book! There are both single page and double page sketches in the book, and I really loved working with the double page sketch Kristine sent me! It was perfect for designing a layout of BabyofTheFamily’s 10th Birthday party. I used Three Bugs in a Rug papers (Ashtyn collection) and some Jillibean soup as well. The pink pearls are Kaisercraft and that sweet little pink clay birdie beside the journaling spots is handmade by Stephanie Hart, owner of My Little Bit of Whimsey. The ebook version – which is a PDF file (13MB) is available TODAY! You can download it to your iphone or ipad using your favorite reader, and you can also print your own copy and use it as you wish! 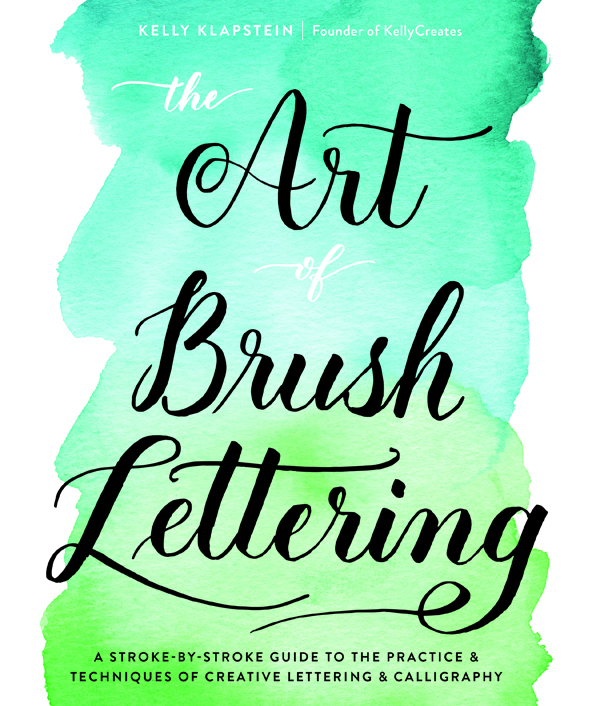 This publication has 100 plus 1 sketches, featuring layouts from 50 international AMAZING TALENTED SUPER DUPER designers, and 50 fabulous pages of inspiration. So ….just leave a comment on this blog post and you will be entered to win a copy of “Creative Scrappers – Creating with Sketches” e-book. Remember, you have to be a Follower of my blog to be eligible to win. I’ll announce the winner on February 22! 25 Comments on Valentine’s Day GIVEAWAY!!! Your so generous Kelly! I would love to win a copy of this book. Your layout…FABULOUS! Congrats on being in the book!! Love your layout Kelly! Congratulations. I would love to win a copy of this book! Please enter my name in your Giveaway, Kelly. I’m having a giveaway too…come enter mine! Hi Kelly!Pretty page as always! Wish to win a copy of the e-book! Hugs! Congrats for having your work featured in this book! Awesome!! Hey Kelly, how cool that you are in this book! Your 2pgr looks wonderful..congrats! Congratulations on your published layout. I see BOF! Oh FUN!!!! That is fantastic news. I came over from Gabriella Dehod’s blog just to leave luv and stumbled upon a give away- I’m not scrounging for free stuff- promise!!! 🙂 Off to see what else you’ve been up to! Hiya girlfriend! All of the Valentines are gone but one….the one that I will include with my giveaway goodies! Will you be the one to win it? Hee, hee, hee! BIG HUGS TO YOU! congrats on your pub! lovely 2 pager! Kelly…..you KNOW I’m playing with you, Honeybee….LOL….Throwing a stone at your window and calling out, “Can Kelly come out and play?” BIG HUGS! What a wonderful layout….love the pinwheels!!!! Thanks for a chance to win such a great book. Congrats on being in the book. Love to have inspiration for those unchocolated days!!! Thank you for the chance to win. Great Layout. Congrats on having it featured in the book. You deserve it. I’m not sure the book competes with chocolate but I’d be willing to give it a shot. Hope you had a nice Valentine’s Day. Thanks for the chance to win. You Rock!!! Good luck everyone. Your layout is awesome! Love those pinwheels and Creative Scrappers!! Looks like a great book! Thanks! I love love love your layout! The pinwheels are so fun and festive. Of course I am a follower. I hang on every word! Congratulations! Not a surprise at all! You are amazing!